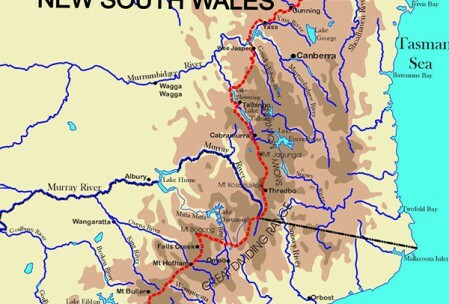 From Talbingo, the Federation Track wanders beside Jounama Pondage past the turbines and giant pipes of Tumut 3 Power station to the base of Keoghs Ridge where it leaves the Powerline Road to follow a disused 4WD track across Buddong Creek to rejoin the Hume & Hovell Track at the Kosciuszko National Park boundary. The track then climbs steadily along an old bridle track to cross Buddong Creek and zigzag up the eastern side of the creek to reach Lower Buddong Falls – one of the most exquisite waterfalls in Australia. At the top of the Falls, the Federation Track leaves the Hume & Hovell Track and proceeds along the edge of Talbingo Ravine with occasional views down into Talbingo Lake through the stands of gigantic mountain gums. 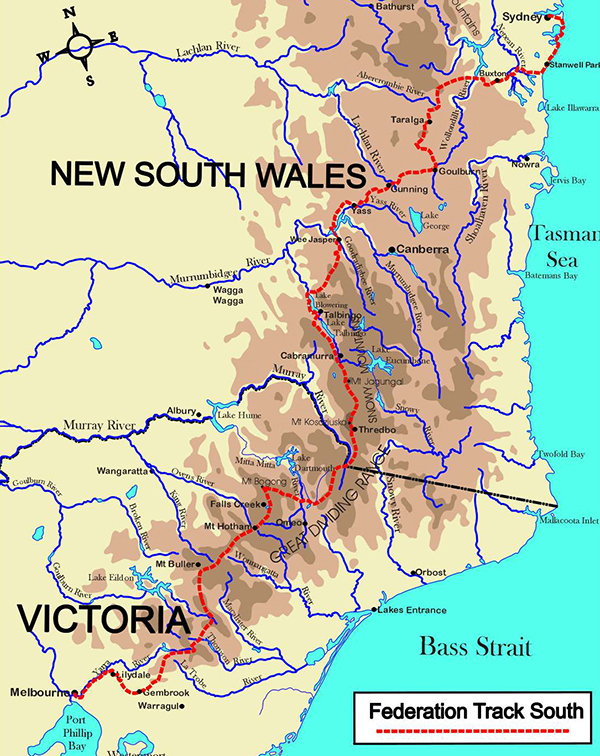 The track crosses Elliot Way and pushes on along the eastern edge of Maragle Tableland with occasional views across the Ravine to Cabramurra. At Blackjack the fire tower provides stunning alpine vistas of the Upper Murray Valley and the Bogong High Plains to the south. The last few kilometres cross the alpine grasslands of Emu Plain to Bradleys Hut and the Tooma Road. Across Tooma Road you enter one of the most spectacular walks in Australia from the western edge of the high country plateau right across the Jagungal Wilderness to Mt Kosciuszko and Thredbo. The scenery is magnificent. Glimpses of the Main Range along the Tooma Ridge and Valentine Falls give way to the towering vistas of Dicky Cooper Bogong and the Gungartans and on to some of the best alpine scenery in Australia – Watsons Crag and the Geehi Valley from the Main Range. The alpine scenery culminates in the views from the Main Range Track down into Blue Lake and the Snowy River Valley on the left and Lake Albina, Geehi Valley and Mt Townsend on the right with views from Mt Kosciuszko across the Murray Valley to the Bogong High Plains. This dramatic scenery is interspersed with cameos of the various huts nestled in amongst the snow gums, crystal clear creeks bubbling their icy way amidst the snow grass and wildflowers and enticing, flower-bedecked, moss-laden frost hollows winding their way between granite outcrops. At night, the sky is a dark blue ceiling pierced with millions of stars shining more brightly than your imagination. During the day, a chilly breeze tempers the hot summer sun. Once experienced, the High Country possesses your soul and your imagination!